While we’re on the subject of British aircraft (see Fairey Swordfish, March 14) we note that Anigrand in Hong Kong certainly know how to find rare planes for a collection, indeed the company motto is: ‘Fill the Gaps’. 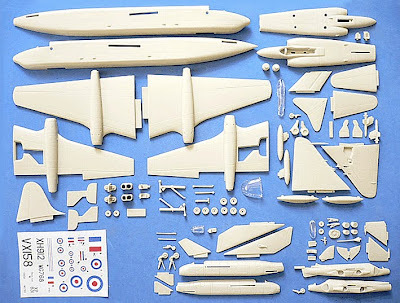 And a recent Anigrand gap-filler is the 1:144 scale resin Short SA4 Sperrin, a British jet bomber design dating back to the post-World War II era. It was primarily built as a ‘traditional but safe’ backup, in case the more advanced swept-wing Vickers Valiant, also under development, ran into major problems. 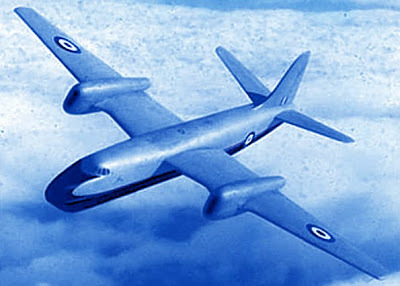 In fact, the Valiant proceeded without a big hitch, so the Sperrin was sidetracked after two flying prototypes had been built, these being used for research trials testing British nuclear weapons. The 88-part Anigrand Sperrin is well-detailed, and comes complete with a transparent cast-plastic window block. However, this fills the whole flightdeck area, so you’ll have some careful masking to do - only the Sperrin’s multiple windows were transparent, and the rest of this component should be in bare metal finish to match the fuselage. Otherwise, detail is good for a resin kit, and with the usual proviso that working with resin takes more care than injection components, the Sperrin should build into an unusual and attractive display piece. And the kit doesn’t stop with the Sperrin - Anigrand’s policy is to often include smaller ‘mystery’ kits along with the main item. And here we get a trio of jet-age Brits, though there’s no problem in identifying them - a Hawker P1127, Short SB5, and Gloster Javelin, an excellent choice for those interested in the early years of the jet age. Component layout picture courtesy Anigrand. To order direct visit Anigrand here.